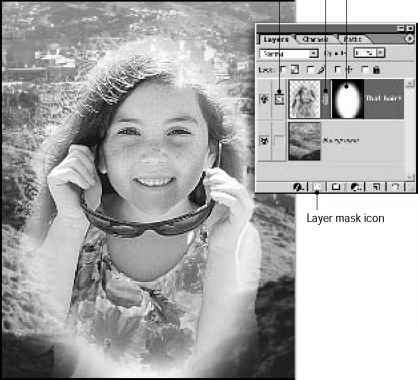 Layer effects are automatically applied to changes you make to a layer. You can edit the text and watch how the layer effect tracks the change. 1 In the Layers palette, select the Jardin 2000 layer. 2 In the toolbox, select the type tool CO.
3 In the tool options bar, change the Font Size option from 60 pts to 72 pts. Although you didn't select the text by dragging the text tool (as you would in a word-processing program), all the text on the layer now appears in 72-point type. 4 Using the type tool, select the last zero in "2000." 5 Type 4 so that the text block now reads "Jardin 2004." Notice that the text formatting and layer styles remain applied to all the text. 6 On the tool options bar, click the Commit Any Current Edits button () to commit your edits and to switch out of edit mode.